Springfield Illinois Redux-- Visit Springfield! This is not your father's Springfield anymore. I wanted to put in more plugs for a visit to Springfield Illinois--our much maligned state capital--and encourage lovers of antiques vintage and history to put it back on their radar. There is a very easy way to make this trip from the Chicago area--take the Amtrak from Union Station that drops you off right in the historic district. We drove this trip--but another time I would consider the train. We stayed at the President Abraham Lincoln hotel and were able to walk to everything we wanted to see--including the Lincoln Presidential Museum and Library. This museum is a real winner Get out of your head your idea of museums with acres of glass cases covered in nose goo and school children finger prints. This place is light and bright and creative--with dioramas (no not like the dusty ones at the state museum) and full of life sized figures and holigrams and creative "you are there" sets. Eating was great. Cafe Moxo on Adams serves a fabulous lunch--you order at a counter and the offerings are fresh and creative. We had homemade cream of tomato soup and two different salads--creative greens, nuts and fruit for Dear Husbola and for me a light vinaigrette over multiple veggies. It included a side--so one wate for one and one hub cap sized warm chocolate chip cookie for the other and we were ready for the afternoon. Another morning while Dear Husbola was in meetings, I walked to Incredibly Delicious at 925 S. 7th Street. It is a house in the old aristocratic district that has been converted to restuarant and bakery. And oh what a bakery. FRENCH to the bone. Delicious bakery of all kinds--croissants and their daily changing individual quiches are the stuff of dreams. Brightly natural lite rooms and french and gourmet magazines will occupy you after you order at the counter and wait for your treats. Antique shopping? Not so much. Or at least we did not do any since we were too busy sightseeing and eating. How Are You Doing on the "Get Rid of Five Every Day" Rule? Well--from initial reports of a few friends--the "get rid of five every day" New Year's resolution is a good one and working! Yuppers--I am sticking to it--the past week tackling two kitchen drawers, a desk drawer and a shelf in a storage cabinet. Our pantry has been ridded of expired "stuff" and a drawer no longer holds my old cell phone and numerous chargers that long ago lost their appliances. Old candles now have been found and are being used in some vintage candlesticks. A stack of great St. Nicolas Children's magazines is now prepped and ready for a show and the shop. Keys that open nothing, two extra serving dishes, and a "never to read again" bunch of books are already on the shelves at Goodwill. Five a day--a good plan for our vegetable intake and a great plan for getting rid of clutter. Wonderful weekend at the Northern Illinois Antique Dealer Association antique sale near Rockford at the Forrest Hills Lodge. Like the old days. By that I mean--the gangbuster selling shows are fewer and farther between over the past years. More shows, longer hours and usually less sales. Except this weekend. The crowds were fabulous. They came and they came--and there was very little let up on Saturday. The show is about 40 dealers--and is a terrific show. Not pretentious. Most of the dealers are good folks --who are out to have a good weekend--not create that faux snob nonsense that you can find in a few shows these days. And they bought. The show is heavy on the country primitive--but we did not sell a single piece of that. We sold items all over the place--paintings-stoneware-lighting-garden-architectural--books--a wide selection. At the risk of crowing--we are happy--and now setting our sights on this as a harbinger of a good show season. Dear Husbola and I headed to Springfield recently--combining a business trip for Himself and a tag along trip for me. I have always enjoyed Springfield--a quirky quiet town--and as a tourist--very manageable and easy to negotiate through the historic sites. This was no exception--and was even more enjoyable than anticipated. We stayed at the President Abraham Lincoln hotel on Adams Street in the historic section. This hotel has had many incarnations over the years--and at one time was even owned by the State of Illinois. It has been fully redecorated and proved to be a great location. Rooms are well appointed and very clean and quiet. One caveat--don't bother to eat there.. There are other far better places. When a restaurant can't get their act together for poached eggs on toast--you know you have a problem. 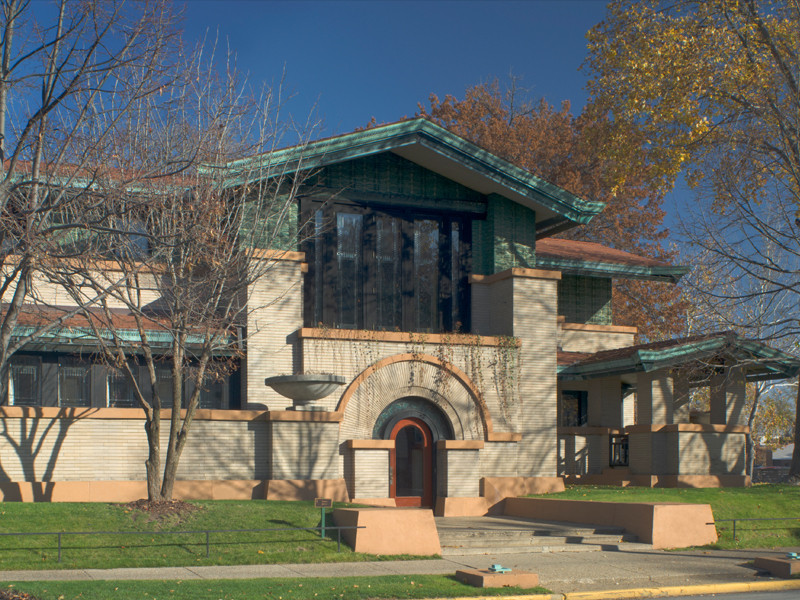 While Husbola was meeting occupied--I walked the 9-ish blocks to the Dana-Thomas House, a fabulous Frank Lloyd Wright open to the public for tours. I happened upon a wonderful tour--just the docent and me. What a treat--no bands of squirrely school kids. No one but me. The docent was fabulous. Mrs. Susan Dana was a incredible Springfield socialite. She had several husbands and spent her life spending her money--and the house is a gem. She hired FLW to "re-do" her victorian home--and the home retains 100 original furnishings and all of its windowns. My tour was on a grey day--and the lamps were lit in the original wattage. Perfect for the tour. Charles C. Thomas, a successful medical publisher, was the second owner and custodian of the Dana-Thomas House in 1944-1981. He and his wife are credited with maintaining the house's original furnishings and design, and with selling the home and its furnishings as a unit to the state of Illinois in 1981 for $1.0 million, significantly less than could have been earned had the household been broken up. Yes--Springfield is the Mecca of All Things Lincoln--but do not overlook this antique gem. The show is at the Forest Hills Lodge--1/2 mile east of route 251 on route 173. The actual address is 601 West Line Road. SATURDAY THE SHOW IS 10AM-5PM AND SUNDAY THE SHOW IS 11AM TO 4PM. This is the 53rd year of this show--and will be our third year of participating. I think there are about 40-ish dealers--and all are housed in a single level area. 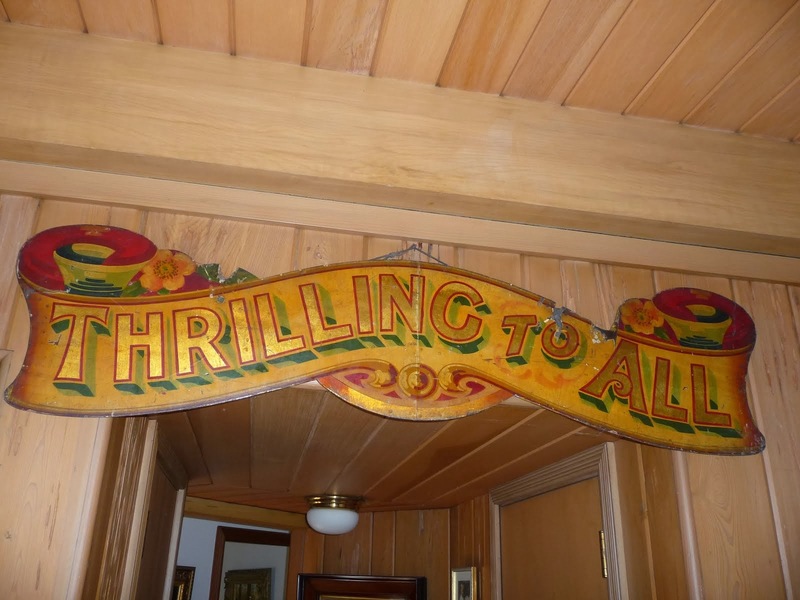 How do you gauge what makes a good antique show these days? I suppose it depends if your perspective is as a buyer or as a participating dealer. This is a well run show--by real veteran dealers who give the net proceeds to area charities. So there is no Big Bad Wolf Promoter who is trying to line their pockets on booth rentals and admission prices. The association invites a few select dealers who are not members--like us--and the show ends up to be a great mix of primitive-formal-and our favorite--eclectic!!! Dealers take care with their display--and it is well thought of as evidenced by the very long line of patrons waiting to get in on opening day. Admission is $6.00 unless you have a dollar off coupon that can be found in antique publications or if you have picked up a show card someplace. I HAVE TWO FREE TICKETS FOR ADMISSION THAT I WILL SNAIL MAIL TO THE FIRST PERSON WHO SENDS AN EMAIL TO beth@littlebohemiaantiques.com. Don't be shy--I don't want them to go to waste. This is an odd time to be an antique and vintage dealer. But it is even odder to be a "collector of things" and then tire of or want to liquidate your collection. What do you do when you don't want to collect what you have collected or want to get rid of some clutter or change the look of your house or shop? Auction ads these days are filled with auctions of collections of yesterday's treasures. While that sounds obvious--more precisely I mean that auctions are filled with huge collections of things that are no longer in general favor and people just want to get some money out of them. Seen any decorating magazines that show 2013's tips using carnival or depression glass? toy tractors? primitive kitchen gadgets? salt cellars? majolica? staffordshire figurines (or figurines of any kind for that matter?) matchsafes? pressed glass? ice cream scoops or chocolate molds? flow blue? barbershop mugs? If so--you and I are reading different magazines. Dear Husbola and I are finding so many auction ads that contain loads of merchandise that are obviously collectors or dealers that are trying to sell items that are totally out of current favor. Dealers who sell mostly in malls may find themselves over run with inventory that is not moving these days. Not at any price. Nineteenth and twentieth century collectibles that were mass produced at the time are not on anyone's list of "must haves" right now. I am not sure they will be on anyone's list again in my lifetime. That does not mean these are not quality items--or that they do not have decorative value. Some people payed big money for these items in years past. The price of majolica in the 1980s was staggering. Not so anymore. Big time not so anymore. Antique malls fall into only two categories--those with dealers who keep and continue to try to sell their outdated items NO MATTER WHAT--and those with dealers who take their lumps and move out the dreck and try to keep things fresh. As dealers we have to be careful when buying at auction--the "Dealer/Collector Dump" can be inexpensive and lull us into purchasing someone else's unpopular items.